Enjoying music with headphones and music players has become a part of our lives, but headphones and these devices can not be separated from our work and entertainment life to bring a lot of inconvenience, the movement of mobile phone listening to the troubles, driving to find the phone to answer the danger Often troubled us, millet Bluetooth audio receiver to solve the emergence of headphones and equipment can not separate the trouble, so you bid farewell to the shackles of wire, into the era of wireless music. mobile phones or other Bluetooth devices to receive the audio signal, instantly wired wireless. A new generation of Bluetooth chip architecture, adapt to the latest Bluetooth 4.2 technology, transmission distance to 10 meters. Optimized design for the antenna efficiency, the system receives a high signal efficiency, can effectively solve some of the Bluetooth device because of the physical barrier caused by unstable connection, audio intermittent problems in the complex interference environment, the signal is not easy to break. Through the depth of the human ear hearing curve, we are Xiaomi Bluetooth audio receiver output audio frequency band accurate adjustment, for the human ear is not sensitive to low frequency, high frequency to make the appropriate compensation, so that the output sound more full, true. At the same time carrying a professional amp chip, providing high signal to noise ratio of low distortion of the signal output, transient response is good, in the stable transmission of the signal at the same time, the output of high quality music. Signal-to-noise ratio is the ratio of the output signal power of an electronic device or electronic system and the output noise power at the same time. The higher the signal-to-noise ratio, the higher the quality of the music playback. Xiaomi Bluetooth audio receiver from the chip, the system has done an optimized upgrade design, signal to noise ratio reached a higher level of the industry, effectively guarantee the output of the music quality. Built-in rechargeable lithium battery, more secure internal circuit protection system, support plug-in continuous playback. 2 hours filled with 4-5 hours, can be used to plug, support the use of side charge side, no power of worry. 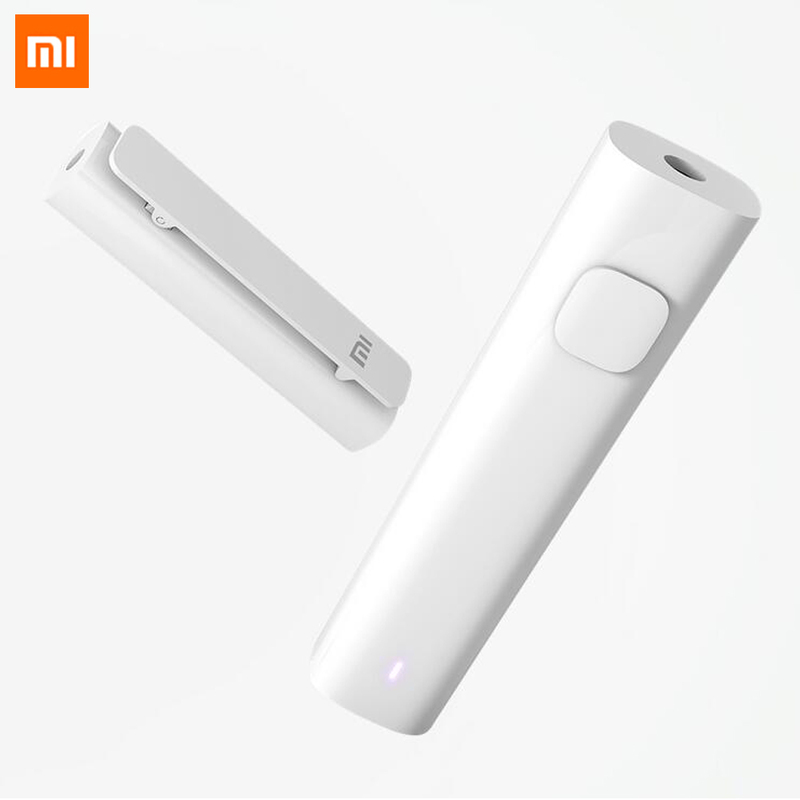 Out of the door, easy to wear Xiaomi Bluetooth audio receiver, small easy to accept, light and more type, tie clip design, so you travel on the road to worry-free. Fitness exercise, the use of Xiaomi Bluetooth audio receiver, through Bluetooth can be directly connected to the phone, get rid of the inconvenience of carrying the phone, let the music with your free run. Fuselage with advanced PC material, with high brightness and smooth touch, modern design simple and elegant, pure white neat, small Smart, simple atmosphere without losing the sense of fashion. With metal stretch clip, easy to carry, fast and easy to use. No need to download any drivers, you can connect two devices at the same time, more rich content, so you have a variety of options, while adding more fun to use, to abandon a single, the two more pleasant. Xiaomi Bluetooth audio receiver with 3.5mm jack design for the product and wired equipment between the connection, making us have a more diverse choice, the use of more convenient way to connect wired headset, wired speakers, car audio, Whether it is sports, home or travel, it can be with you around. The Xiaomi Bluetooth audio receiver is of high quality.